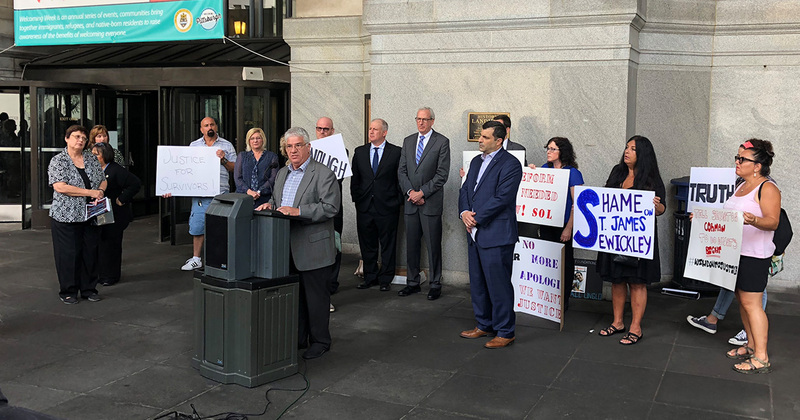 Pittsburgh – September 18, 2018 – At a news conference today at the City-County Building in Pittsburgh, State Sen. Wayne Fontana (D-Allegheny) supported the call to open a 2-year window to allow victims of child abuse by priests to file civil actions against abusers and enablers — including the institutions who covered up the abuse. The recommendation for eliminating the statute of limitations was one of four suggestions made by a statewide grand jury that uncovered allegations of abuse by priests and a coverup by the Catholic Church. The abuse allegations covered several generations. “We need to eliminate the statute of limitations and allow victims to seek justice. We must ensure that the rights of victims are preserved. Child abuse victims of years past must deal each day with the injustice. It took courage for victims of abuse to come forward, testify before the Grand Jury, and tell their stories. “Now, it’s up to the men and women of the General Assembly to give victims standing so they can seek the justice that has eluded them for decades and generations.